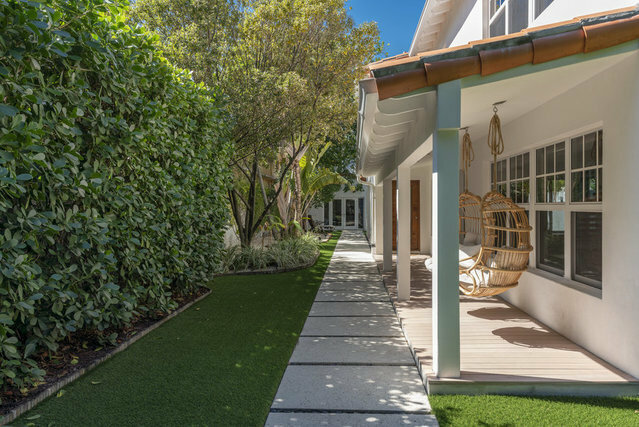 Unique opportunity to own an urban oasis South of 5th street, the last private single-family residence in the most exclusive neighborhood of Miami Beach. Enjoy total privacy & security on this 7,000 square foot lot, surrounded by privacy walls. An award-winning sustainable property, the house is solar powered with redundant battery backup for power outages. House features impact windows, foam insulated roof, open kitchen with spacious living area & 3 bedrooms accompanied with a large terrace for entertainment. All Miele appliances, gas stove, Miele washer & dryer, Duravit fixtures, sinks, & toilets. Guest house features an office with a king size bed & a full bathroom. The property extends to the back alley & private carport in the back is accessible through a large secure electric gate.